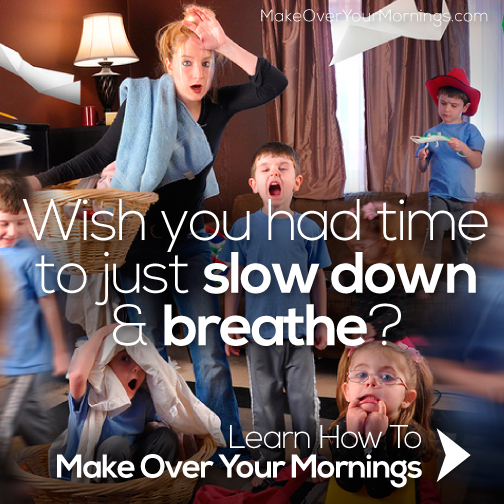 Are you hoping to establish good morning and evening routines for your family this year? Back-to-school season is the perfect time to start new routines that will last you throughout the school year. 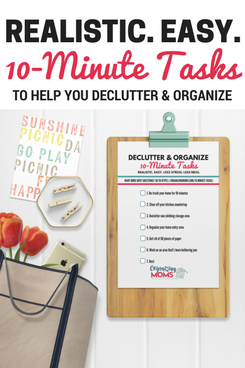 Besides helping your kids to learn where to put their new school things, and how to get ready in the mornings, it’s a great time to set up new daily routines that incorporate school, homework, and fall activities. Back-to-school season is also a good time for parents to start new routines. Even if it’s been years since we were in school ourselves, the school schedule affects everyone. It’s a good time to brainstorm about what is and isn’t working with your current routine. Right now we have the opportunity to think of ways to build in time for projects, self-care, and increased productivity. I’m ready for a new routine! Where do I start? Start by establishing your morning and evening routines. Morning and evening routines set the tone for the day. A smooth morning makes for a much calmer day. The preparation for that smooth morning happens the night before. They’ll make you feel super-prepared. Having your outfit laid out for you in the morning eliminates all kinds of issues, and it makes you feel like you’ve really got it together. And we could all use a little more of that, right? You’ll see the results right away. Changing your routine isn’t easy, but it’s much easier if you can immediately see the positive results. Morning and evening routines have such an impact on your whole day because they help shape your attitude and mood for the day. The good news? You can start building your routines now. Whether school starts next week or next month, it’s the perfect time to establish your morning and evening routines. 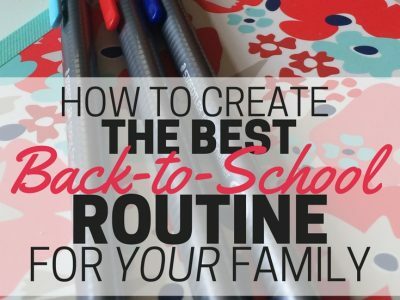 Working on your morning and evening routines will help your family with transitioning into the new school year. If you have more time to practice them and get used to them, that’s a bonus! You’ll get back on the school-year sleep schedule. Working on new routines can help your family ease back into earlier bedtimes and wake-up times. There’s always room for tweaking or adjusting your routine. By practicing your new routine, you’ll see what works and what doesn’t. That will help you to make changes based on what you and your family need. Every family is different, so all of our routines will be different too. I think we’ve all heard the advice that says we should wake up early in the morning, exercise, read, work on writing a book, and eat a healthy breakfast before our kids get up. That works for some people, but not for everyone. Some of us are getting up at 5 am just to make it to work on time – you shouldn’t feel pressured to wake up even earlier to do a bunch of stuff someone else told you you should do. You get to decide what’s important for your family. You know what will work. While looking at other people’s routines can give you inspiration and ideas, it’s best to customize your routine for you and your family. I struggled with creating a good routine for our family. It seemed like I’d get a good system down, and then chaos would ensue, and everything would be back to craziness. 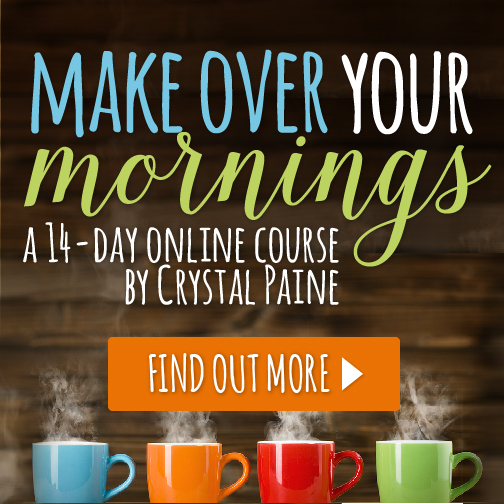 The one thing that helped me the most was taking Crystal Paine’s Make Over Your Mornings and Make Over Your Evenings courses. The courses helped me organize my thoughts about our routines, and build them based on what’s important to our family. They also helped me to better deal with disruptions to our routines. I took both of the courses before, but I’m re-watching them and doing the exercises this fall as I’m preparing for our new school year (both courses come with lifetime access so you can watch them over and over as your situation changes). Our kiddos are going to kindergarten this year, so there will be big changes in our routine! 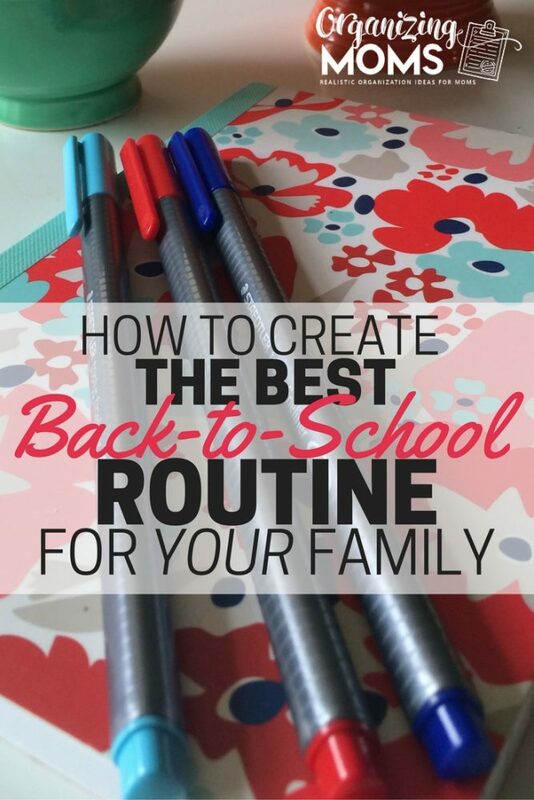 By taking about 15 minutes each day to work on building our routines, I feel like our family is growing calmer, more organized, and more prepared for the school year to come.